Smoke detectors may have already gotten their first connected upgrade thanks to the Nest Protect, but two startups think they’ve got a better idea, and both offer devices that are cheaper than upgrading a home with multiple smoke detectors to a $99 Nest Protect. There’s apparently a market. A study last May by iControl found that among those surveyed, 60 percent wanted to start their journey to the connected home with a connected smoke alarm. Essentially, people would like to get a text or a call if they’re out and their house is on fire. Both Leeo, a stealthy startup that has raised $37 million to build connected products for different geographic markets and Roost, a startup founded by a low-power Wi-Fi guru have tackled the connected smoke detector in different ways. 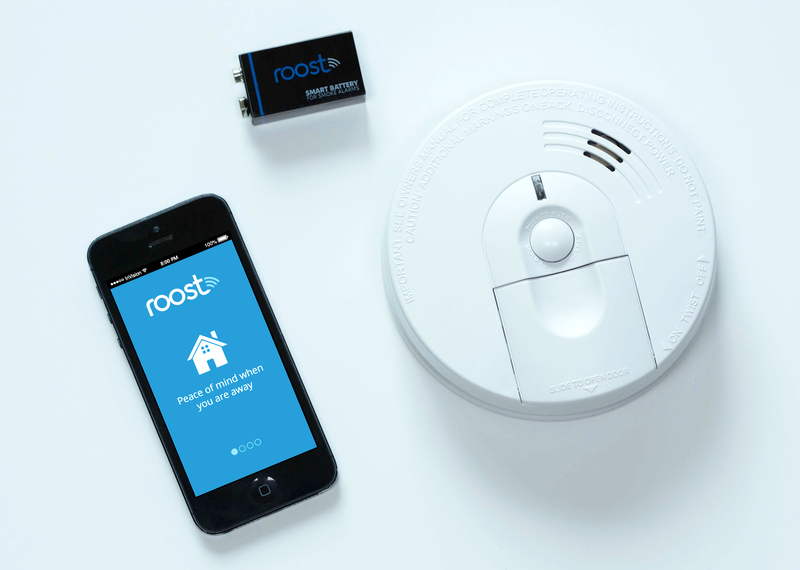 Roost, a startup founded by former Ozmo Devices CEO Roel Peeters, has a compelling take on the connected smoke alarm built out of what looks like a traditional 9-volt battery. For between $35 and $25 (the more you buy the more you save) consumers buy the Roost Smart Battery that is packed with sensors and Wi-Fi module, yet fits in the existing 9-volt battery slot. The battery measures how much power is left in the battery so you can get a notifications via the Roost app when the smoke detector’s battery is about to run out. By the way, the Roost battery is supposed to last 5 years. The Roost battery also detects the sound of the smoke detector going off, which means that when your alarm sounds it sends you a text or phone call. The Roost will be available in the second quarter of next year. I’m pretty darn excited about this product in part because it will let consumers do something familiar –replace their battery — and get the benefits of connecting their smoke detector without buying a whole new gadget. I’m also excited about the prospect of low-power Wi-Fi modules and expect the Roost guys to expand the concept outside of the smoke detector eventually. You can see the Roost at the Garage@Connect at our Structure Connect event on Tuesday and Wednesday. If replacing a battery isn’t your style or maybe you want to get a new device, the designers at Leeo have combined their smoke alarm detection device with a night-light. The night-light includes LEDs and can glow in 16 million colors that you can set via an app, but it also has a temperature and humidity sensor that could come in handy for other purposes like helping your thermostat control the temperature inside your house. And of course, it has a noise sensor that listens for a smoke alarm and then sends the alert via a phone call to a set list of numbers you provide in the app. 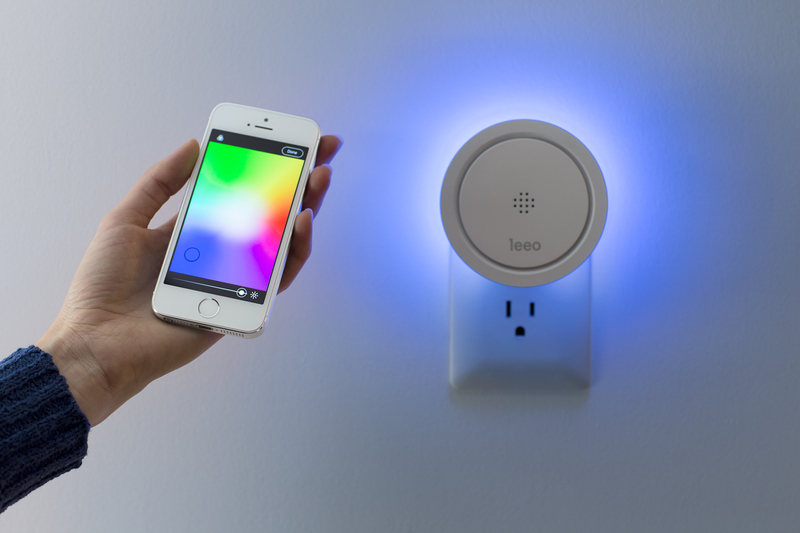 The Leeo costs $99 but you only need one per floor on average. The app experience is nice but is so far only available for iOS devices. My daughter liked the fact that you could change the colors on the night light and I liked the easy install. I just plugged it in. In my house, I have five smoke detectors spread over two floors, so the Roost probably makes more sense from a cost perspective. Both of these devices let you keep your existing smoke alarms, which is probably an easier sell since a smoke alarm is something you generally hope you don’t have to use, making it hard to justify spending a fortune replacing them just to get a bit of connectivity. Stacy, If you have 5 smoke detectors in your house and they are all connected via an interconnect wire like mine (check your manual and your electrical installation), you theoretically only need to buy one battery and put it in one of your detectors. Since a smoke alarm from one detector should make all detectors sound their alarms, the Roost battery from one alarm will hear the alarm, because the alarm it is in should also sound its alarm. Unfortunately, for me at least and probably for others, this won’t work to notify you if a battery on another detector is out. You would need to place a battery in each detector if you wanted to receive an alarm/notification for that. Roost needs to allow us to specify an HTTP Get/Post URL for notification purposes! Then we can integrate it with IFTTT, Dropbox, Google Drive, Twilio, or any third party API. This is what will set this product over the top and will be accepted into the hacker/Dev community. The two best devices on the market for in-home fire detection are a nose, and a pair of eyes – very attractive price point, from what I hear. Unless you are asleep, and smoke then reaches you and you don’t wake up. So your EARS would come in handy, and this is where these two devices come in handy. And what if you are not home, and your eyes and nose don’t apply? Again, these devices have utility. Roost seems very promising. Sure to make Google’s purchase of Nest have less value. There is one caveat, however – you have another mobile app to manage. What would be better (and would make me a buyer) is if, in addition to Roost sending an SMS or calling a number upon the alarm going off, Roost would send an HTTP Get/Post to any URL I specify upon the alarm going off. Then I could integrate it with third party APIs, which would make Roost extremely valuable. I already have a web server running on Raspberry Pi, and it monitors my house for security, and sends out notifications. Rather than depend on Roost to have their cloud working in order to initiate the phone call or SMS, it would be great if Roost could send an HTTP Get/Post to a URL on my local Raspberry Pi. What if the Roost servers are offline? That would present a security problem, and allowing us customers to have a way to circumvent this would add a lot of value to their product, as well as allow us to integrate it with third party APIs with existing IoT platforms. The question is, where does Roost store the phone number and email address for the battery to notify? Locally on a storage location of each battery? Or in the Roost cloud? If in the Roost cloud, then this means Roost is probably sending an HTTP request anyway. So, Roost, are you listening? This little addition to your battery would be amazing. Another addition: allowing us to set the frequency for another listener: home security systems. For people with existing security systems, they can use your battery in their smoke alarms to listen for the security alarm to trigger, and have it send out an alert in the same way. And now you have just enabled every existing security system to become IoT integrated. Make these two additions before you launch! You will put a dent in the Nest universe! I was looking at either 1) hooking up and monitoring the interconnect wire that gets triggered via the existing 9V battery in my smoke detectors upon detection of smoke/fire on my existing alarms or 2) adding a microphone to listen for the alarm when it is triggered. Both of these can be done with an Arduino as mentioned in this forum and elsewhere — http://forum.arduino.cc/index.php?topic=260181.0. But if I could use a 9V battery that would listen for me, problem solved! I would also like to specify a custom URL the battery would notify.